Metal box, probably India or the Middle East. Set with numerous semi-precious gemstones and glass beads. One stone missing. Set with numerous semi-precious gemstone cabochons, one stone missing. Small Makara heads and wire work similar to jarao work. Exquisite and rare sliding box, possibly Mongolian or Northern Chinese. 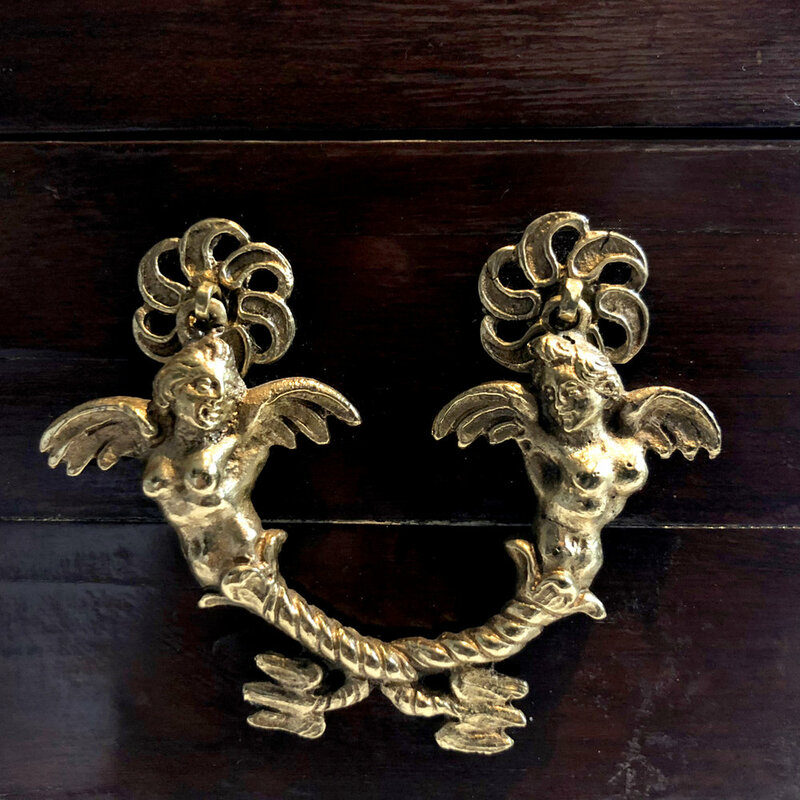 Features hand chased copper dragons, phoenixes, waves, and other motifs. Set with cabochon gems. Lined with faded silk brocade featuring five claw dragons. Very finely made piece. 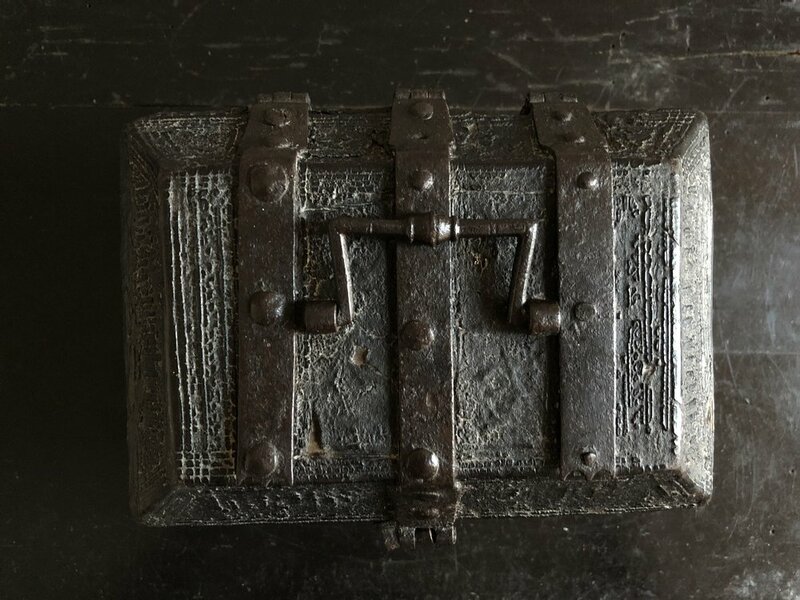 Rare German iron casket with chains, built in lock, and hasp for a padlock. 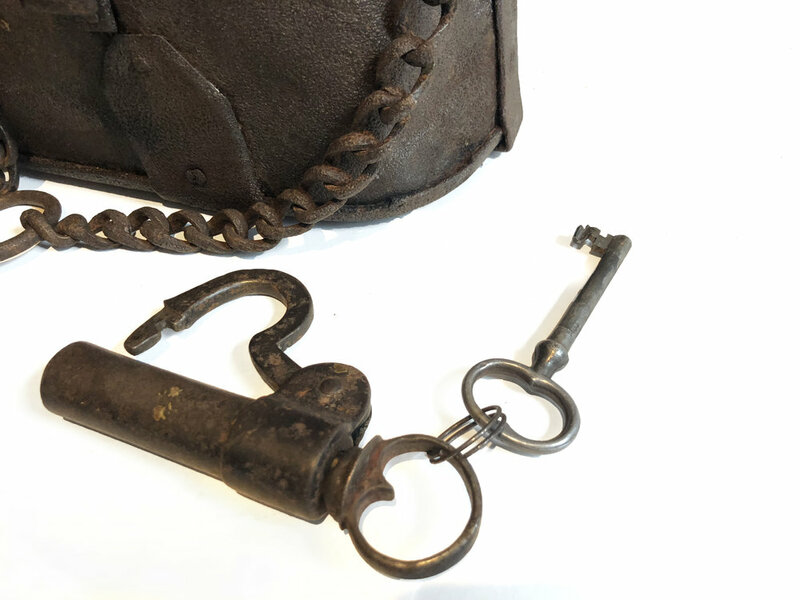 Associated 18th century screw type padlock. Key for built in lock is a replacement. All locks function. Very rare, leather has traces of text tooled into the leather in Gothic script. Small size, no key. Unrestored, totally original, save one very old repair to one side. 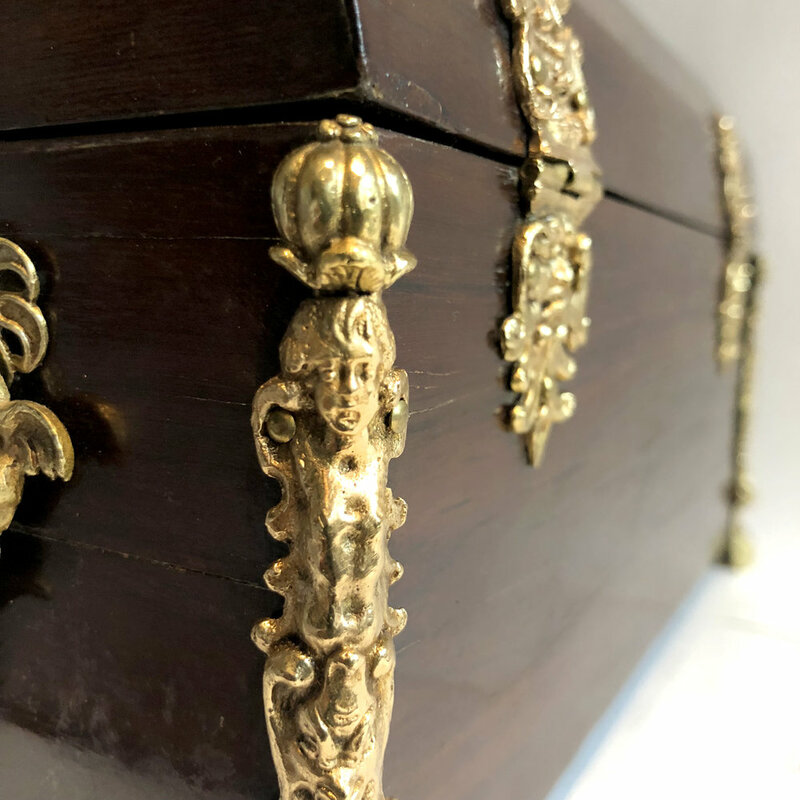 A Louis XIV wood and gilt brass mounted casket. Late 17th Century casket. It has nicely cast restored/cleaned mounts and there does not appear to be any elements lacking. Louis XVI style, frequently also called Louis Seize, is a characteristic French style in art, architecture, and decorative motif which developed during the reign of Louis XVI (1774–1793). It saw the final phase of Rococo-style art as well as the birth of French neoclassicism which sought to evoke the artistic styles that were just then being rediscovered in Herculaneum and Pompeii. With rectangular body on larger base with four feet, the pierced decoration with medallions encompassing seated figures and heroes fighting mythical creatures, the lid with more fantastic figures, some standing, some seated, other fighting, with two handles, the lid with clasp, and standing on bracket feet engraved with recumbent animals. 7.25t x 8.25 w inches approx. Beautifully crafted casket with scrolling foliate designs. Gilded with silver and gold. Key is 18th century or earlier and matches and works the lock perfectly but is associated and not the original key. A heavy and substantial hexagonal box with hexagonal domed cover and octagonal knob, decorated with Oriental inspired motifs such as dragons, Chinese bats, a Japanese crane, other birds, and a butterfly, but also a flower motif which resembles both a Japanese mon and the French fleur-de-lys. Made from steel, motifs etched, partly heat tempered with bluing. Traces of silver, gold and rose gold in the motifs which might look yellowish or orange in photographs. Blue/Purplish velvet inside. This piece is exquisitely made, and very high quality. It is all finely etched and the pieces are clean and fit perfectly. A sharp and crisp locking mechanism and tight fitting lid. No loose parts. A really fine piece that took considerable skill and effort to create. I have not been able to find anything like it, and I suspect it might be one of a kind. It is similar to a tea caddy, but the steel construction is so substantial that I think it would have been a jewelry box. I have seen comparable types of etching on caskets from Sweden in the 19th century. 6.25 tall and 4in wide. approx. This incredible box or coffrecito features painted floral interior lid and hidden moon and stars motif on the underside of the box. A wonderful and mysterious box of a pleasing petit size perfect for a side table. The lock is missing the key and the the catch is missing a catch loop. Traces of velvet and gilding on hardware. Original painted interior, back and underneath. Truly a special piece of Baroque Spanish colonial art made in Peru. 6 1/2 D 10 1/2 W x 8 T inches. Gothic revival casket entirely hand chased and pierced with chisel work to cut out the Gothic tracery overlay that frames a burgundy red velvet. Wonderful twisted moving handle on top. This is a truly magical and rare piece signed by S. Calvo, Burgos, Spain. S. Calvo is also known as Maese Calvo, or Saturino Calvo Vélez (Burgos 1895-1972). Heavy and substantial. 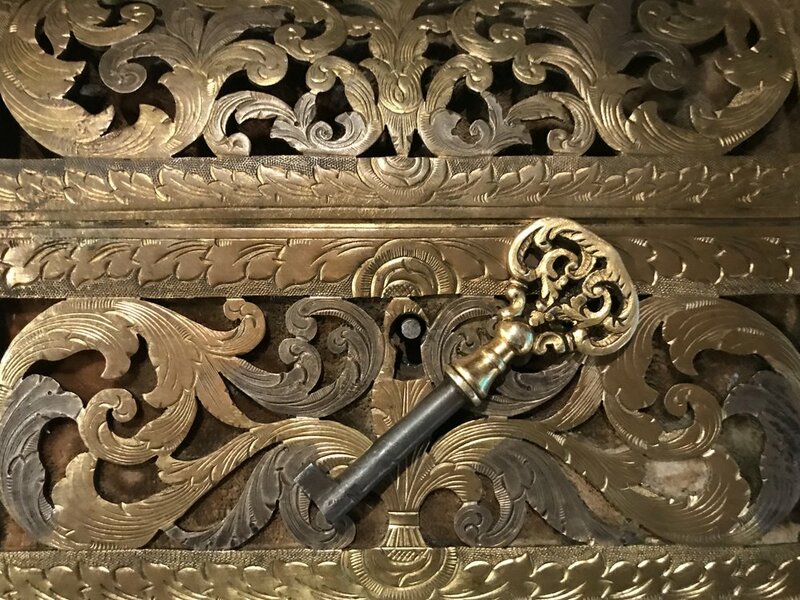 There is no key but the lock is fully intact. The velvet is in good condition with no big losses or tears or rot. There is residual dust and a little bit of wax from a candle in places and on the inside. Possibly someone kept candles in this piece. It's really outstanding and made in the true manner of the 15th Century pieces it emulates. Every inch has been worked by hand, not pressed out by machine or cast. All forged iron.